At the 1958 World Cup our opponents didn’t really know much about us as there was very little television back then. My goal in the quarter-final is quite famous, but I spoke to my friends at the time and they had only heard the goal on the radio. People wanted to see it but TV was not common. Some goals are great goals in unimportant games, and some are important because of the game. The ones I scored in 1958 when I was 17 were the ones that made my reputation. In the semi-final against France there was a big expectation. People ask me if it was difficult because I was only 17 years old, but no, I had no responsibility. In 1970 there was real pressure but in ’58 other players in the team were the ones under pressure, thank God. France was the best team in the tournament so after this game we were very confident we’d be champions. To win in the final… I didn’t know what to feel, it was very emotional. I just cried. The King of Sweden came to see us. I had no idea what to say to a king, all I wanted to know was if the people back home in Brazil knew that we had won. The best party was when we got back home. There was a carnival and my father and people from the local tavern came to see us. In 1958, that was the best Brazil team individually. 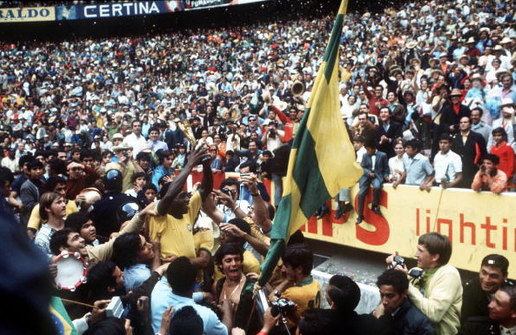 Garrincha was the best player in the world and we had Didi and Vavá, but the team was not organised as it was in 1970. My talent is a gift. I used to tease the other boys who played football with me, but my father said that’s unfair as I’ve been blessed with a gift from God, and you have to be humble, keep learning and never think that you’re the best. The 1966 World Cup was the toughest and I got injured. Other players got injured too, it was too tough. Opponents wanted to foul me but I don’t believe that they actually wanted to hurt me. But that foul caused problems with my ligaments and I went on as we had no subs and the team needed to have all 11 players on the pitch. We were the best team in 1970. We won, I scored lots of goals, but they show the misses against Uruguay and the Czechs and that save from Banks more than the goals. I’ve scored over 1,000 goals in my career but people remember the ones you don’t score. Carlos Alberto used to come forward on the outside and that fourth goal in the final looks easy, but it only looks easy because we practiced that a lot in training. We just made it look easy. That team in 1970 had four players who played in the same position at their club sides—me, Gerson, Revelinho and Tostao. People said that the manager Mario Zagallo was crazy for playing four number 10s in the same Brazil side, and the press said that it would never work. People often think that the number 10 shirt is special for Brazil, but in 1958 I was wearing number eight for my club. I got the number 10 shirt in a draw. And Romario preferred the number 11. It’s not always the number 10 shirt that is the special one. Every young football player wants to be a star and that’s not possible. You have to be part of a team and success only comes when you work as part of that team. Eleven stars? No, never. My father named me after Thomas Edison. But when I was young, in a small town in Brazil the other kids started calling me Pelé. I didn’t like it and I didn’t want to be Pelé — “my name is Edson!” — I used to fight against it but they kept calling me this and it just stuck. 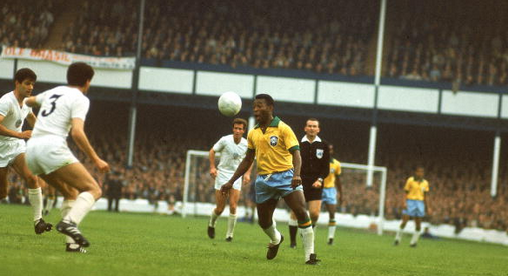 Now, it’s good to be Pelé. I gave the shirt from my final game to my father—he had given me everything. I like the way José Mourinho manages. Referees are humans and human beings make mistakes. Qatar being given the World Cup? Hmm, it was difficult to understand that decision. Fifa doesn’t know what to do about the situation, and holding a World Cup there? I’m not so sure. I would have loved to play in the same team as George Best. Beckenbauer, Moore and Facchetti were the three toughest players I faced, but they were always honest. I was always tough in every game that I played in, but I never bit anyone. Yes, I used to play the guitar. I still do. My 1,000th goal was a penalty in the Maracana Stadium [in Rio de Janeiro] in front of 200,000 people. People say penalties are easy but that was the only time on a pitch that my legs were shaking before taking a kick. That was the most difficult goal I ever had to score but it was also the one that everyone expected me to score. Before I took it there was silence. I’ve never felt such a huge responsibility as that moment. Retiring was hard. It’s hard to be away from the emotions and the crowds, but I stopped in my prime. This was a gift. For the World Cup this summer, Germany, Spain and Brazil are the best three teams. Then after that, Argentina and Italy. England to win this year? Ha ha… No. Look out for Chile, they will be very good this year. The only other World Cup we’ve had in Brazil was in 1950 when we were the best team but we lost. I really hope this doesn’t happen again this summer. Lionel Messi is not the same player for Argentina as he is for Barcelona. At Barcelona he has a great team around him who he plays with every week but he’s not so used to playing with that Argentina side. There are currently protests and problems in Brazil and that’s not new. The corruption is not with the players but with politicians because football is the most important income for Brazil. Don’t boo the players. Yes, people need a better life, but politicians rob people, not footballers. There were problems before, during the Confederations Cup, but fortunately Brazil won so it calmed people. But this summer if Brazil does not win the World Cup there could be some big problems. I’m very confident that Brazil will win the World Cup, but football is a box of surprises. This is the first time in the history of football that Brazil has a team that is better at defending than attacking. We currently have a problem setting up attacks and this is why Neymar is so important. But that now means the pressure on him to perform his huge. Messi: The best of all time?